December 19, 1958 was the eve of my wedding day. Home on leave from the U S Navy I was staying with my parents in the home I was raised in although I had left it some three years previous. That evening I went to visit with my future wife at her parent’s home a few miles away. It was close to midnight on a viciously cold night with the temperature down well below the zero mark on the thermometer. Snow was falling lightly and drifting across the highway as I returned to my parent’s home. I was following another car at about 40 mph when that driver lost control of his vehicle and landed in the ditch. I stopped my ’51 Studebaker business coupe that I owned at the time to insure no one was injured and help as I was able. The occupants were a couple near my own age, out on a date. They had no idea what they should do about their present situation. As they were uninjured, and their car was running fine supplying heat, I told them if they just stayed put I would drive to my brother’s home, borrow a farm tractor, and haul them out of the ditch. They had little other choice. It was probably a half hour later by the time I got back to them, and in the bitter cold I managed to get them back on the road and headed toward their destinations. I returned the tractor to my brother Bert’s farm, and returned to my boyhood home to rest a while before getting married that day. I promptly forgot about the entire incident. A few days later I received a telephone call from a Mr. Greenblatt. He told me that he owned a furniture store, and asked that my new wife and I stop by for a free wedding present. Not sure about receiving “free” items I yet decided to go to the business. Upon our arrival Mr. Greenblatt asked us to select any item from his store, no strings attached, as a wedding gift. Unsure what to do, I finally selected a very modestly priced wooden chess set which was gift wrapped and given to us. As we left the store, surprised, but feeling wonderful, Mr. Greenblatt asked if we remembered aiding a young couple a few nights earlier when they were in the ditch. Wondering how he knew about it, I asked. He informed me the young lad was his son. I then tried to give back the chess set as I wanted no payment for helping someone on a terrible night, but he insisted it was not a payment, but a bona fide gift. I have that chess set yet today, 54 years later. At the end of WW II I when I was about 7 or 8 years old I, along with my older brothers, would arise every morning at 6 o’clock, groggily dress, and head to the barn to tend the cattle after their long night alone. On a dairy farm the cattle are always the first order of the day. Human needs are taken care of after that. 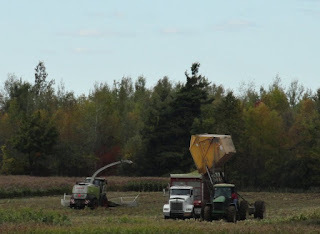 We would work in the barn for an hour or more before we got to eat our own breakfast, change clothes, and walk the mile to school in fall, winter, and spring. By this time in history my mother had developed a keen taste for the round pink wintergreen candies that had the word CANADA stamped upon their face. Although we were a large family that didn’t lack for food (which included candy) under any circumstances, mom’s metal can with the tight fitting cover held her private stock of the wintergreens and we children were not supposed to touch them. This meant, of course, that it was merely a challenge to locate her latest hiding spot, and see how many we could pilfer without her knowing, or at least not saying anything about it. Often that was the first thing to do in the morning. We all slept upstairs in our two-story home. After arising we trudged down the stairs supposedly to head for the barn. However from time to time some of us would start a search for mom’s candy stash. Sometimes it would be high on a pantry shelf. Other times high on a shelf in the big cabinet in the living room. We boys would boost one another up to search these higher places. Inside the washing machine was another prize location. Once located each of us would take two and head for the barn. They had to be eaten very soon so that the pink residue on our tongues would at least mostly go away during the hour or so we were completing our morning chores. I never asked her in later years, but she must have known we enjoyed the little game of hide and seek nearly as much as she did, and it wouldn’t have been near so enjoyable if they had been in a dish in plain sight. These candies were first made in Canada in the late 1800s, and brought into the United States in the early 1900s, about the same time my mother was born. I still enjoy them some 70 years after I first tasted them. 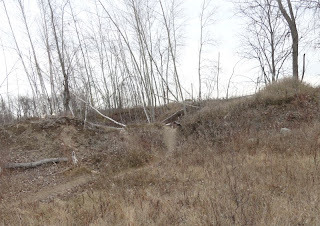 About a mile from my home there is an approximately 20 acre mostly abandoned gravel pit. 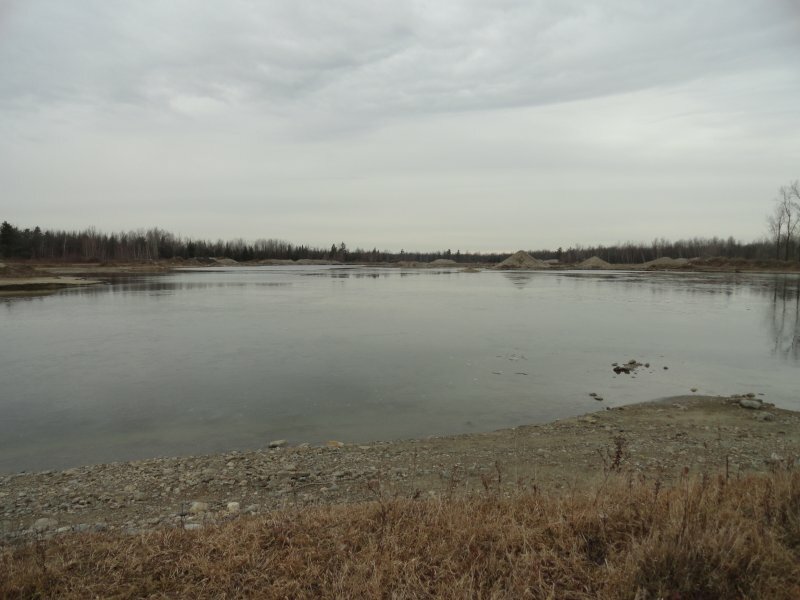 Gravel has been removed from the site for at least 75 years, ever expanding, and ever deepening. 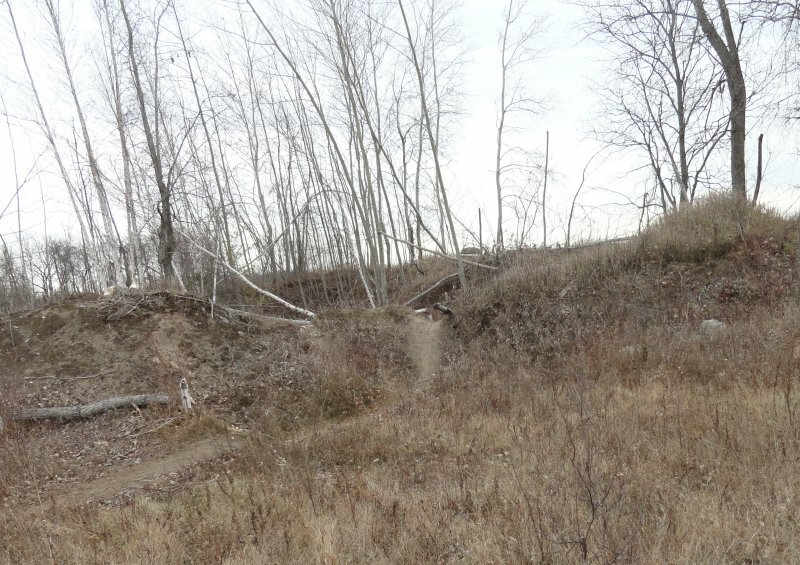 In places it is at least 100’ deep where gravel was removed with a dragline. 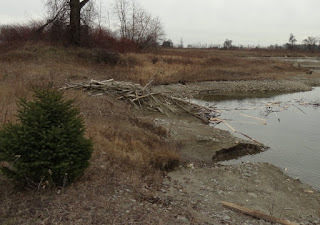 In more recent years the gravel banks have largely petered out, and only occasionally are smaller amounts of gravel yet taken. 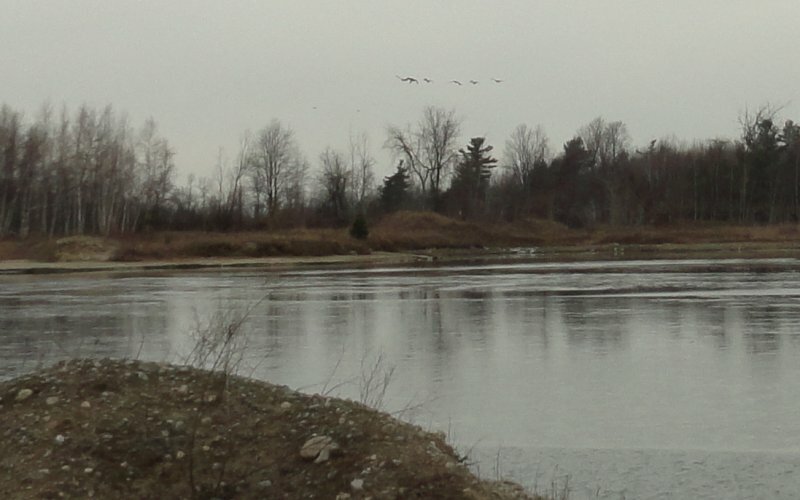 As I approached it a few days ago rafts of geese took wing from their sanctuary. They settle in nearby harvested corn fields to reap the bounty of remaining ears of corn scattered on the ground. 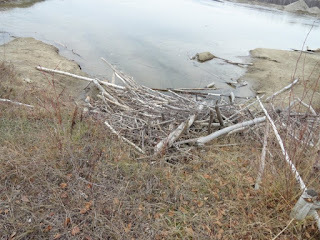 I continued nearing the area where I knew beaver to have a den. Situated near a beautiful small evergreen the den can be noted where the scattered limbs are on the surface of the hill. The entrance is underwater, dug into the bank of the gravel pit. It extends back in a moderate distance and then rises to above the water line. Once inside they are snug, and reasonably safe from nearly all predators. 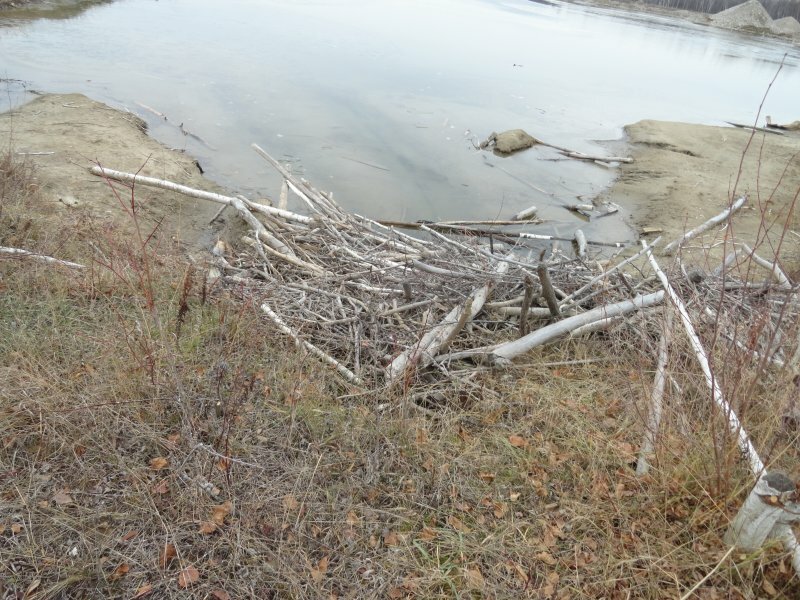 Beavers store a winter food supply which can be seen floating on the water. 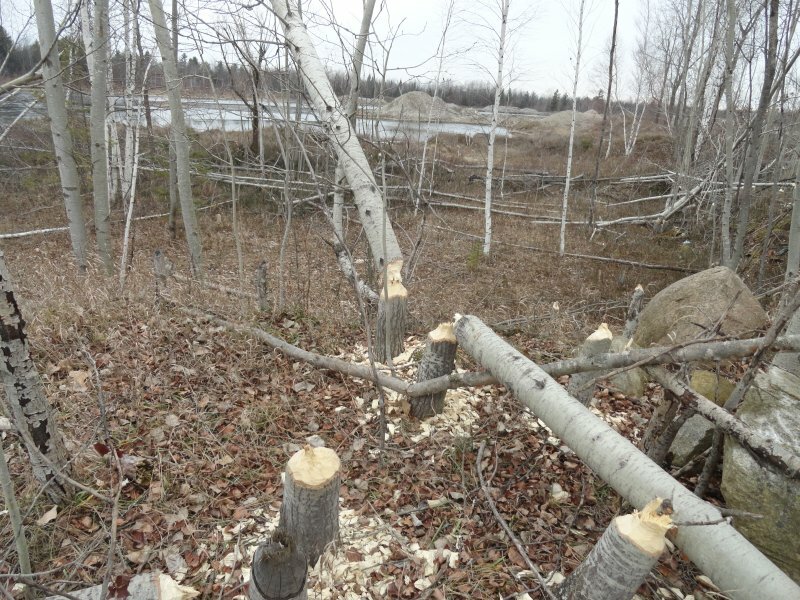 It is merely small sections of tree trunks, or limbs, of which they will eat the bark from through the frozen winter months when access to fresh food is hard to get to. These medium size poplar trees are the result of the beaver’s work of gathering that winter food supply. Note the size of the chips on the ground where they have removed the wood necessary to fell the tree. 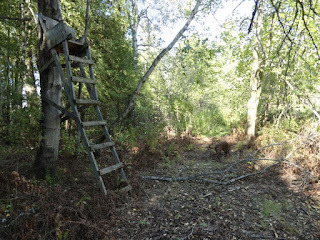 This dirt pathway leading down from the hill is their skid way where they drag the sections of tree down to the water’s edge from that small stand above. This is an abandoned den from previous years. 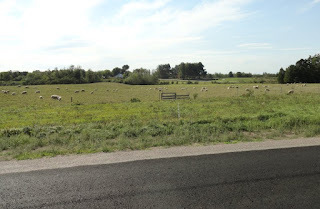 All nearby trees had been felled, and as the food supply depleted they were forced to move on to greener pastures, or maybe that should be greener woodlands. Often our country's workers are the unsung heroes that we pay no attention to as they silently go about their business each day. Today I noted these workers trimming trees along the power lines near our home. 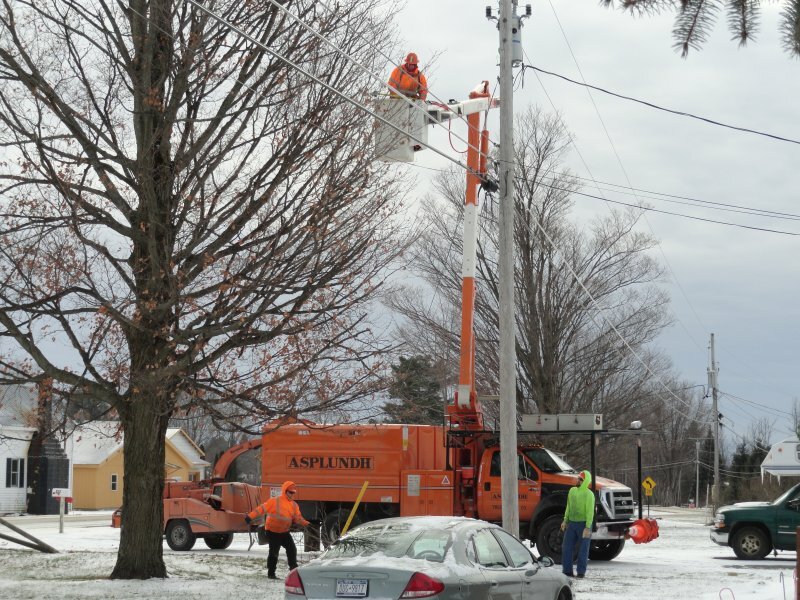 This is to remove the branches in near proximity to the wires that might sag onto the wires during a heavy ice build-up. It makes sense to get ahead of the possibilities. With snow on the ground, a temperature in the teens, and a gentle breeze blowing, it can't be a wonderful experience to be up in that bucket, but there he is. Thank you, gentlemen, for doing your job in not-so-pleasant-conditions. Although my father had been a hunter when younger, and owned a rifle and a shotgun, in his middle years he no longer used them. We children always played with toy guns, but were not allowed to handle my father’s weapons. It was undoubtedly a good idea, but we didn’t think so. When I was about thirteen or so, I found a new friend named Dean Cox. His family owned and operated a greenhouse a couple of miles from our dairy farm. Nearly every Sunday afternoon I rode my bicycle to his home to hang out and see what sort of mischief we could get into. Dean, whose parents obviously thought differently than mine, owned an old Mossberg .22 caliber rifle. At some time in its distant past it had been clip fed, but the clip had long since disappeared reducing it to a single shot, bolt action, model. Often on our Sunday afternoons together we would use his rifle to target practice. This is what E. J. Dailey’s Trapper Supply House has been reduced to today. First though, we would have to make the half-mile trip down the road to E. J. Dailey’s Trapper’s Supply House, where we bought our afternoon supply of .22 caliber ammunition. I loved that part of our afternoon at least as much as our target practicing later. Dean and I would walk the distance with Dean telling jokes the entire time. I never did understand where he learned them all. Once we neared our destination it was not hard to know we had arrived. E. J. concocted his trapping scents on the premises and the smell would nearly cause us to gag, but after a few minutes of getting used to it, it wasn’t too bad at all. 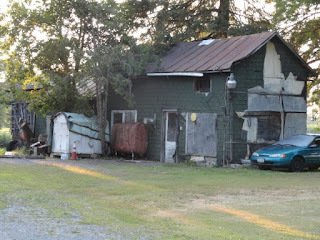 The Trapper’s Supply house was a wondrous place for Dean and I even though it was no more than 10’ X 25’. E. J. had an old desk in one corner, near the front, where he handled his correspondence with trappers all over the world. He also had an ancient typewriter, on a pull-out tray of the desk, with which he wrote his column for the Fur, Fish, and Game magazine. Next there was a small area where he had a gun rack with several guns. It was an ever-changing array as he dabbled in gun sales on a regular basis. Also in this area was a shelf with many different common calibers of ammunition. From there you could pass through a doorway into his inner sanctum where he worked on his trapping lures for sales. Shelves were lined up with the various lures for each species of fur-bearing game. Also in that section was a selection of knives for hunting and trapping. 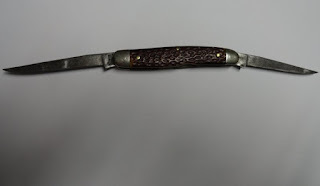 I bought a Utica Kutmaster Muskrat Skinner folding blade knife there when I was about 14, and I carried that knife in my right front pocket until I was about sixty years of age. By that time one staghorn handle had cracked and the blades were honed down to about half their original size. My brother Fred saw it one day and asked about its origin. He decided I should retire my old faithful, so he found a new one nearly like it somewhere, and bought it for me. The newer one had fake bone handles, but I carry it yet today after having given my original to my youngest son. I was all of 19 years old, and thought of myself as rather worldly what with 2 ½ years in the Navy already under my belt. I had joined VP-8 a Navy Patrol Squadron with a dozen P2V5F aircraft the preceding August. Our squadron was destined to be split up into three groups beginning in early January 1958. Three aircraft and ¼ of the squadron personnel went to the Azore Islands. An equal number of our members were scheduled to Argentia, Newfoundland, “The Rock”, while the remaining ½ remained in Quonset Point, Rhode Island, our home base. After three months we were scheduled to rotate stations. As a newer squadron member I was to remain at the home base during the first three month period. However another squadron member with my exact rating was married and his wife was due to have a baby during the three month period so I agreed to take his place deploying to Argentia with the first group while he remained at our Quonset Point home base. Little did I realize that for three months our enlisted personnel had nothing to do, but eat, sleep, and work. There was no way to leave the base to go on any sort of liberty. We worked whenever there was work to do. The rest of the time we slept, ate, or played cards mostly. The card playing most often was some sort of gambling, mostly poker of one sort or another. So it was that one evening I was playing poker with several “friends”. Four players were actually in the game while two or three others stood around watching. A fellow that worked right in my own shop with me named Fitzpatrick was sitting across from me. In a hand of five card draw I drew one card to the Ace, King, Jack, and Ten of hearts just because it didn’t cost much to do it. Against all odds I drew the elusive Queen of hearts for a Royal Flush unbeatable hand. Fitzpatrick after his draw held three aces and a pair of deuces. Our betting began to escalate quite rapidly causing the other two players to drop out. Another fellow that I knew quite well, named Alonzo, had been standing behind me for a long while. Suddenly he grabbed the cards from my hand and threw them on the table face up with the garbled statement, “Lookee heah what dis boys got.” This immediately caused me to win the hand, but with little in the pot versus what the potential win was. I went on to lose my entire stake and had to quit shortly thereafter. It was a very long time before I realized one day that Alonzo had been tipping off Fitzpatrick throughout the entire game that evening what I was holding. When Fitz continued to bet against my Royal Flush Alonzo could not make Fitz understand to quit so took the action that he did. Being young and gullible I always had to learn the hard way. Back in April of this year of 2012 I wrote a blog about owning my first car. I loved it, and have found since that many others can recall their first car with vivid details. Several have either written comments on this blog site, or emails describing that same attachment I had. Now here’s the deal. Maybe 20 years ago I purchased an MG Midget convertible from a friend of mine here in Northern New York. I recall that he bought it a few years prior, maybe 25 years ago, in the Boston, Massachusetts area. The automobile has not had the engine started in at least ten years, but it is complete and restorable. Details are fuzzy now, but in some manner I learned that it had once belonged to a college girl that drove it from the Boston area to her college in another state. It was probably her first car, but I don’t know that. I do not know her name. I do not know her address. I do not know her phone number. I know no way to contact her, and if I did she would probably think I had a screw loose. However if she were to contact me with proof that she once owned this car, and wished to own it again, I would consider a reasonable offer. Other than that the car is not for sale. 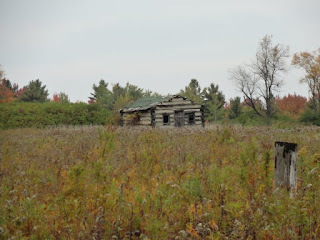 I have it stored in an old barn on my property, and that is where it will remain for the few years I have left. Shelter from the elements is ordinarily what I would think of when I hear the one word spoken. That includes, but is not limited to, rain, snow, hail, sleet, overheating, sunburn, lightning strikes, hurricanes, and many other conditions hazardous to the health of humans. Again, I usually think of shelter from these conditions as some sort of a building which takes in a lot of grey area. Therein becomes the question just what is a proper shelter from the elements? Some would venture to say a human needs a proper castle, or he doesn’t have anything. Others might concede that a nice mansion could suffice. Then there are those who can do with a nice home built to standards that will protect an owner from all but the most violent of Mother Nature’s quirks. The standards can be lessened due to abode building ability, or necessary environmental conditions. You won’t likely need some forms of protection in some areas. Following up on necessary shelter for the existing conditions it can be determined that while traveling the travel vehicle is often your shelter, versus your home. As you drive down a country road in a rainstorm your car keeps you warm and dry under most circumstances. Thus all you have done is downsized the amount of area you are protecting from the elements, vehicle space rather than home interior. I came to some of these conclusions while riding a motorcycle in a rainstorm. My first thought was that I wished I was in my nice warm home, rather than riding in a cold rain in the middle of the night a thousand miles from home. I then decided I should have had the forethought to pack a tent for such occasions. As I continued to contemplate my possibilities it came to me that I was wearing a proper rain suit, and was remaining warm and dry. It was just that my protection limits had moved in to within hundredths of an inch, rather than several feet away. I was yet being sheltered from the elements as much as was necessary. Shelter then can take many forms, and need be no more than is necessary to meet the present conditions. The next time you’re out and about on your motorcycle make sure you have good rain gear in your saddle bags. Driving down the graveled Sand Road of Lisbon in St Lawrence County, New York this afternoon I was admiring the fall colors as I ambled along. 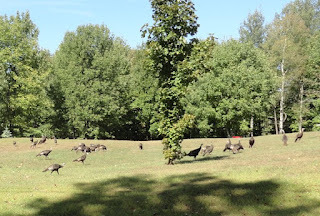 As I approached the driveway to the local sportsman’s club shooting range this scene unfolded so I stopped and took a photo just for your enjoyment. The top color has not arrived yet, but it’s still impressive as it is. A little further down the road I came upon this scene which I took a photo of. 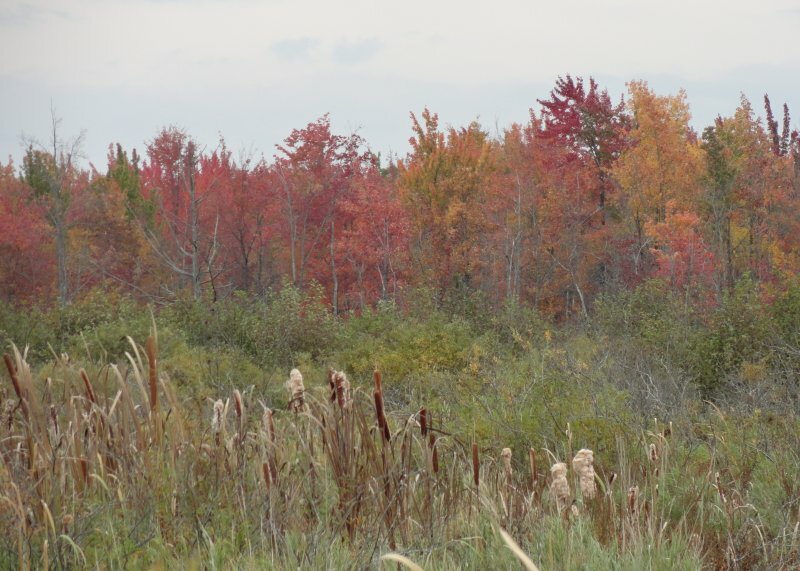 I called it cattails and colors thinking that covered it quite well. As I progressed along I came upon this older hippie abode. I recall it being built in the earlier half of the 1980s, by a fellow who wanted to live alone. This being a couple of miles from the nearest residence, it’s about as close to living alone as you can get in this part of the country. It is about ¼ mile back from the dirt road. Some thirty years later it stands yet alone, rather rundown and derelict. The gentleman only lived in it two summers and one winter, abandoning it prior to the second winter. Continuing along the road I chanced upon this pond just in time to see a beaver drop below the surface near that floating log. 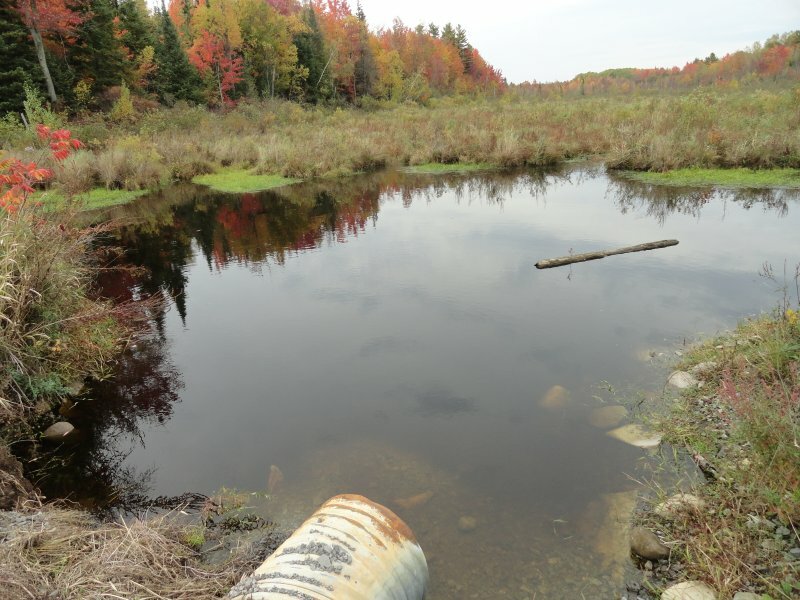 Note the area directly behind the pond has no large tree growth as the beaver population has used them in their daily life over the years. 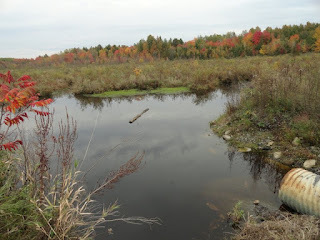 This is the same pond but showcasing a bit of color not seen in the preceding photo. With that my afternoon jaunt came to an end. In Lisbon, New York there is a large dairy operation. Although I live somewhat near the center of operations I know little about it. 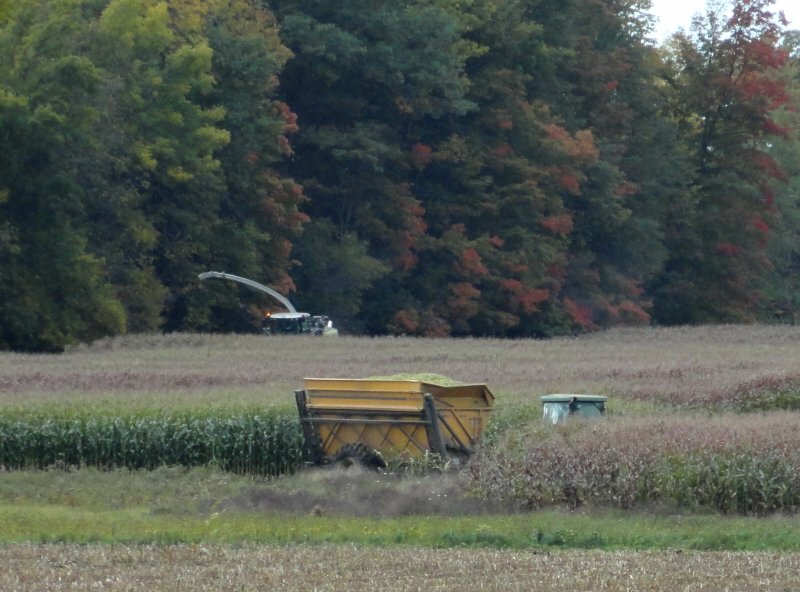 However today I happened to be driving past a large field where corn had been growing all summer, and noticed it was being harvested. Having little else to do I decided to watch for a while. 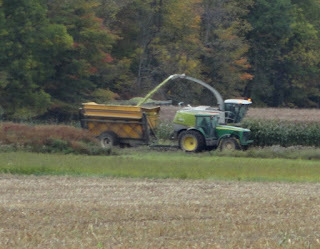 When I stopped, the corn chopper was driving down the field blowing a stream of the chopped crop into a wagon being pulled by a common John Deere farm tractor. 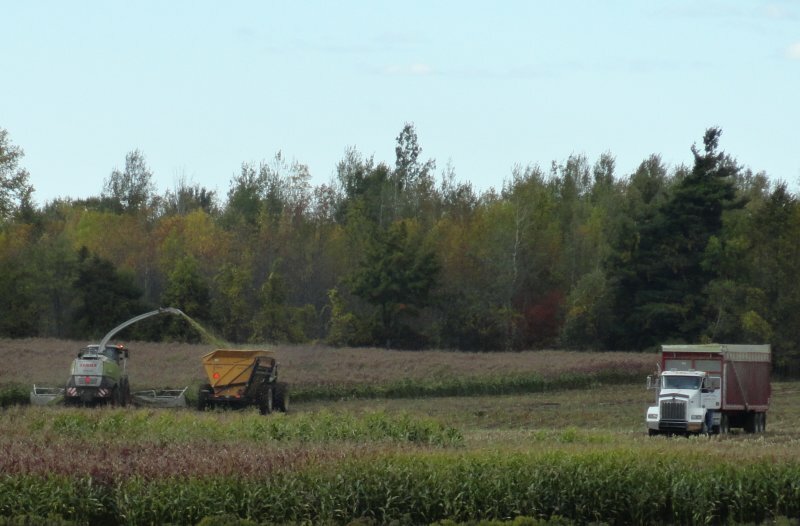 In the second photo it can easily be noted the wagon is filled to overflowing, and while the chopper sits idle the load is headed back up the field toward a large truck parked on a slight hill. 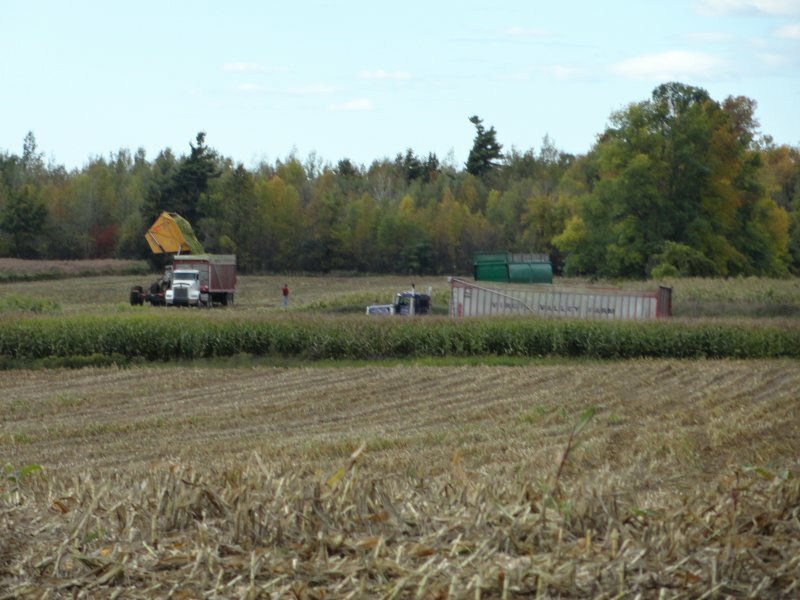 The third photo shows that the entire wagon box has been hydraulically lifted and is being dumped into the truck box. 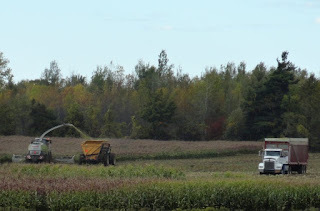 The truck driver, having little to do but wait, is standing on the side of the tractor undoubtedly receiving instructions of what to do next. Meanwhile that chopper, worth hundreds of thousands of dollars, remains idle. In this photo the unloaded wagon box is settling back to its retracted position ready for another load while a second truck pulls into the field. 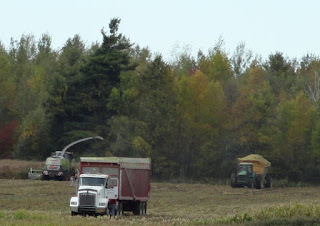 The chopper is nearly concealed by the red and white truck as it returns to the point in the field where it finished the preceding load. 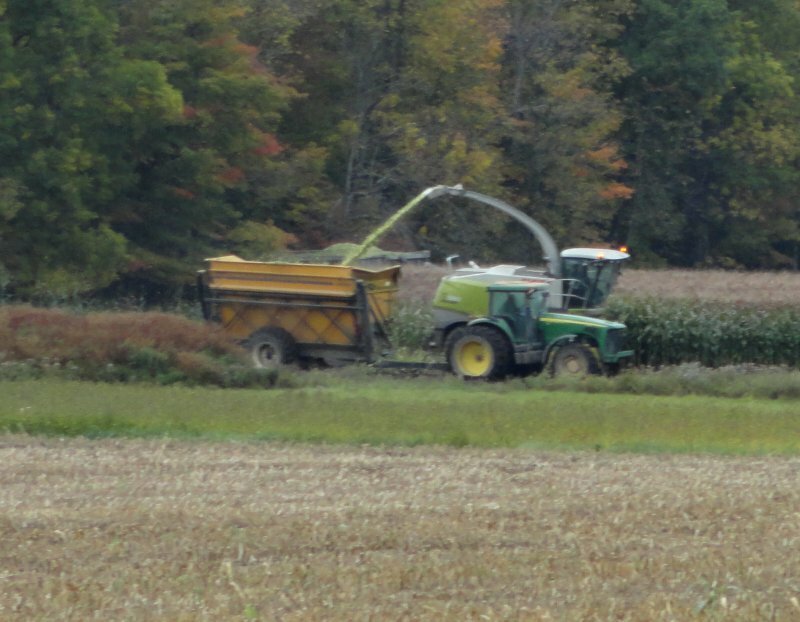 In this photo the machine has chopped across the back of the field and up the left side about 2/3 of the way. 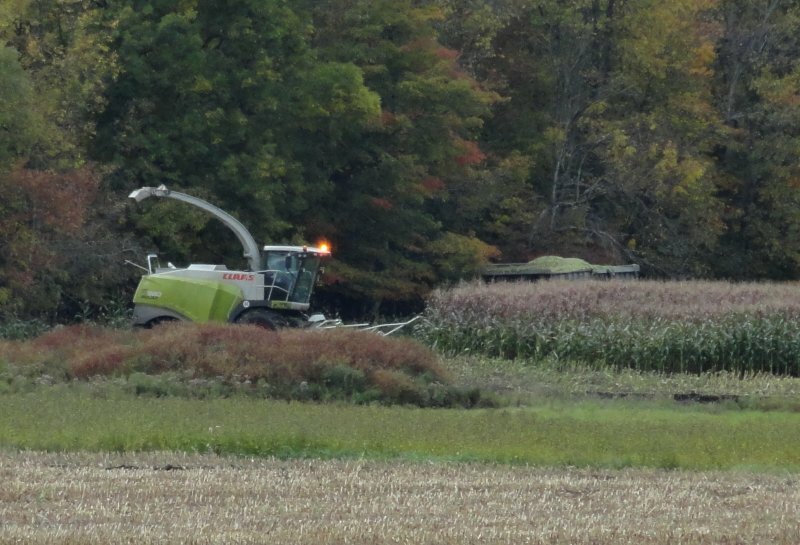 This has once more filled the wagon which has made its way nearly around the front of the field heading toward the truck for a second time. Oops, it encounters a mud hole, and spends a couple of minutes pawing its way through the mire. The chopper awaits action. Once more the wagon delivers its load into the yet awaiting truck box as a third truck enters from stage right. With three truck drivers and the chopper driver all accomplishing little much of the time, this is not a smooth operation. 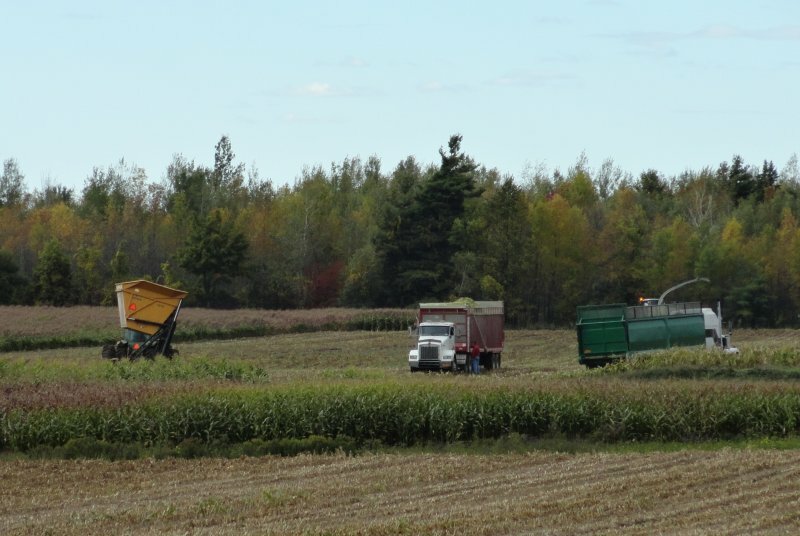 As the chopper and tractor/wagon combo move across the front of the field a third load is nearly full. Over the top of the wagon another load appears to either be mired in mud, or broken down. At any rate it is not moving, nor has it moved since I’ve been watching. Again the chopper sits idle, while the unmoving load in the background does likewise, as the loaded wagon once more plods over to dump its load in the truck. The loaded wagon again stops moving forward in the apparent mud hole, but once more works its way free in a couple of minutes and continues on its way. Normally the trucks drive alongside the chopper and are directly filled which is much faster than this operation. When one truck fills, another takes its place, and an almost continuous stream of corn erupts from the spout for endless hours. Mother Nature’s recent rains cut the speed of chopping by many times, costing the dairy operations thousands of dollars. I attended a one-room school for my first six grades. For my remaining six I rode a big yellow bus to school each morning, and returned on it to my home each afternoon. When I was 24, in 1962, a son was born to my wife and I. He began his studies in a Baptist Church school in Mississippi. It was located right across the street from our home in Marion so he walked back and forth each day. The church minister, whose wife was the school teacher, raised, kept, and hunted bird dogs, so I figured this church thing couldn’t be all that bad. In January 1970 I moved to California, along with my wife, two sons, and a daughter. The older son and the daughter, both being of school age, learned to ride a big yellow bus back and forth to school on a daily basis. In May of that year our family once more moved, this time to New York State. The son and daughter were each passed on to their next grade in California, and did not return to school until that September as New York State children do. On the first day of school the big yellow bus stopped out front of our home, picked up the two of them, and off to school they went, not to return home until mid-afternoon. As the years passed the second son joined the first two children, and still later our newest child, our baby girl, also joined them for the daily to and fro on the big yellow bus. It was now approaching the early fall of 1979. I was now 41, while the eldest son was 16, and the baby-girl was now 8 years of age. With nothing better to do one morning, I awoke in the midst of a heart attack, or a myocardial infarction, as the good MDs like to put it. For about a year I wondered about my mortality. In the fall of 1980 I had a little arterial bypass surgery, and back to work I returned, good as new. All that year the old yellow bus kept up its daily trip, never lagging, nearly always on perfect time, as regular as clockwork. The elder son graduated high school and stopped riding the bus as he joined the Marine Corp, but the big yellow bus kept up its daily stop to pick up the other three. The eldest daughter graduated high school a couple of years later, and then the second son three years after that. Still the big yellow bus stopped on a twice daily basis for baby girl. Then it came the summer of ’87 and baby girl turned 16 years of age. I bought her, of all things, a pickup truck. She loved her Toyota and drove it back and forth to school each day. All of a sudden one day the big yellow bus stopped stopping. How could it do that after all of these years? Several years passed. I had some more arterial bypass surgery in ’91. Baby girl married, and lo and behold, a beautiful girl child was born in 1992, and later, in ’94, a boy sprung from this union. It was only a few years until the big yellow bus began stopping at our driveway again as baby girl and her family built a modest home next door to her mother and me. This continued until the fall of 2011 at which time grandbaby girl had graduated from high school, and her younger brother had finished also. Once more the big yellow bus stopped no more. Now it is a year later and on a daily basis I watch the big yellow bus pass my home with nary a hesitation. It has come to a time in my life I realize I must be getting on in years ‘cause the school bus doesn’t stop here any more. I like to wander about the woods and fields merely to see what I can see. I don’t much care what people have named things though so this is not science, merely sightseeing. 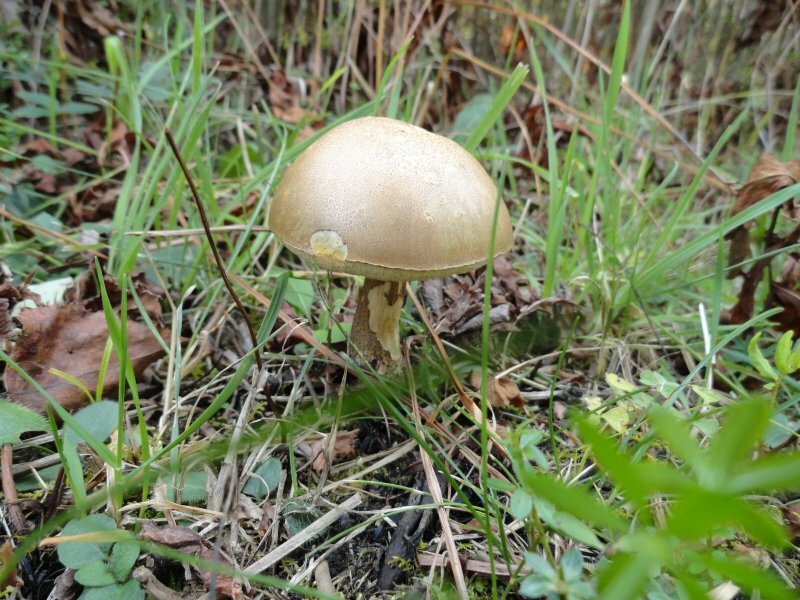 Today I saw this brave little mushroom sprouting from the undergrowth. 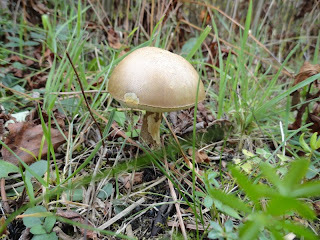 It looks like a mouse or something, may have been nibbling at its stem. Mice have got to eat too. 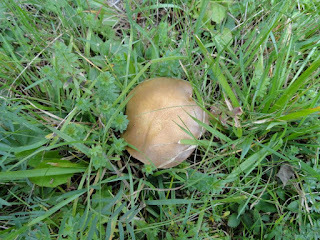 Nearby was another, but probably in a slightly later stage of growth. It seems to have split open, and flattened somewhat. Further along my path was yet another in what I would guess to be yet a later stage of development. All of the brown surface has gone wherever brown surfaces go, leaving a white remnant, turning yellowish, and apparently dying. 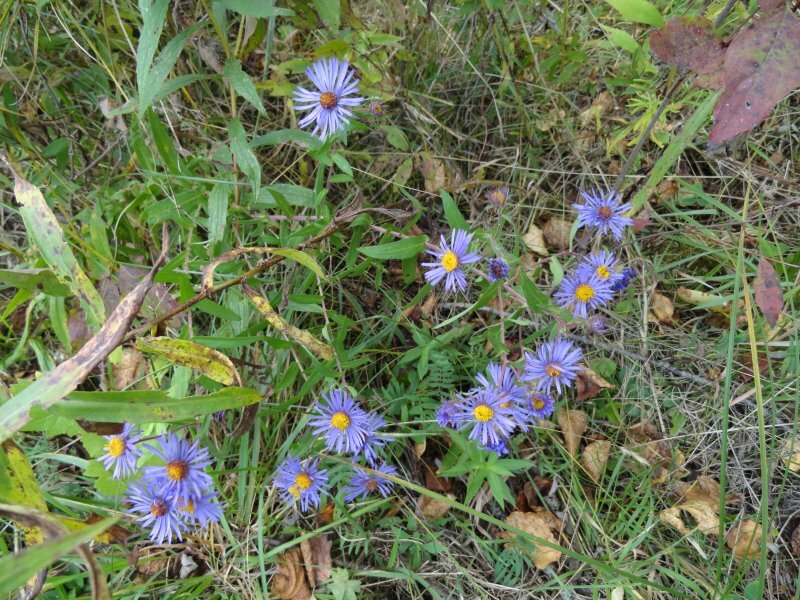 Along my day’s path were these little blue flowers with the delicate thin petals. I thought them rather pretty with their more violet tint than plain blue. Some of them have a darker center button indicating they are past their prime I suspect. This is a closer view of the above, showing some of the different shades of color all on the same blossom. This is one of the darker centers that seem to have lost the yellow parts. 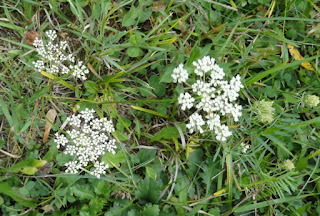 As I moseyed on my way I discovered these white flowers. 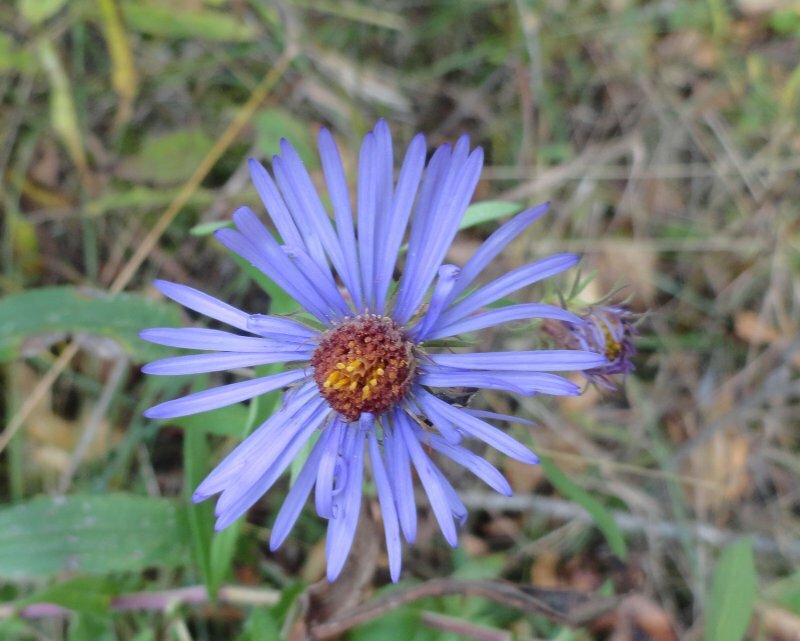 They are very close in looks to the preceding blue ones, and are possibly the same thing. I don’t know. 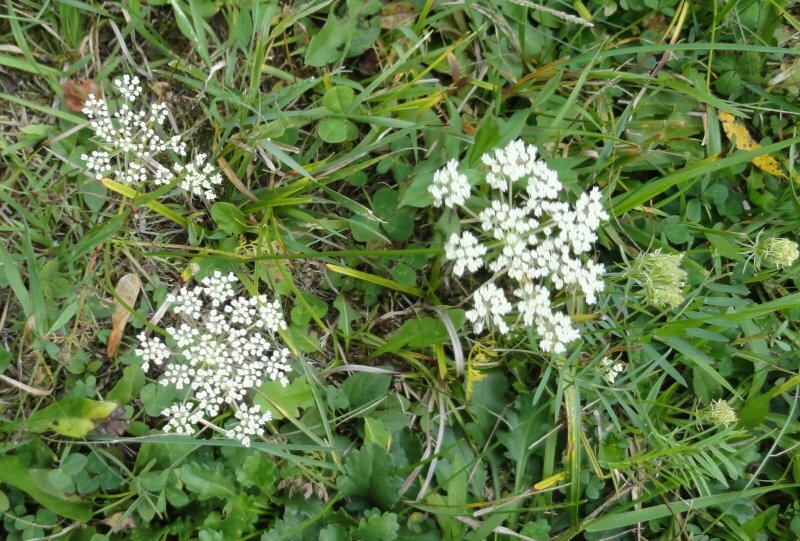 Here are more white flowers, but these are much daintier. 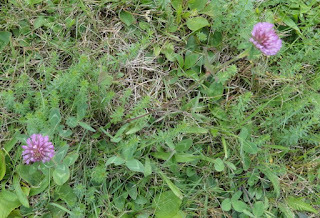 You can see by the size of the clover leaves in the background that they are tiny. 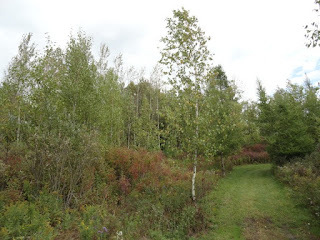 As I went on my way again I noted this slender birch dancing in the slight breeze of the beautiful afternoon. Note that in this photo it is more or less straight up. This is quite obviously the same sapling, but now gracefully nodding to the unseen audience over to our right somewhere, as it continues on its ever so graceful ballet. 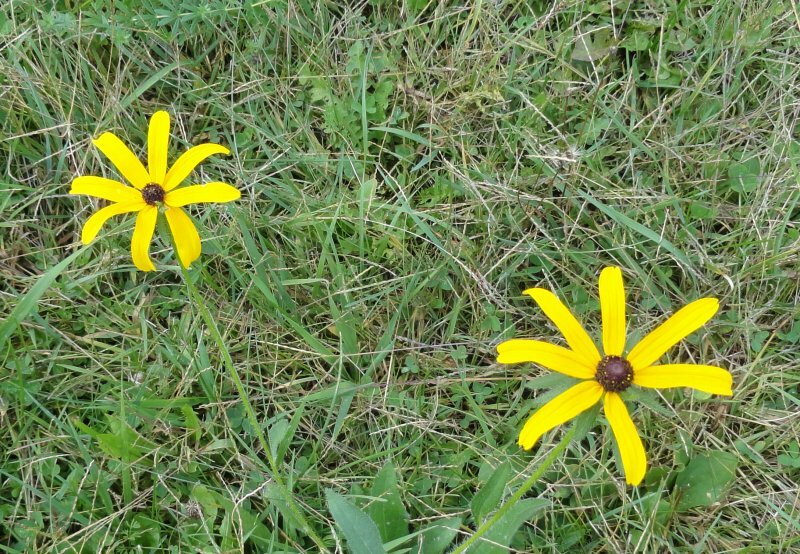 We’ve seen some blues, and whites, now how about a splash of yellow? 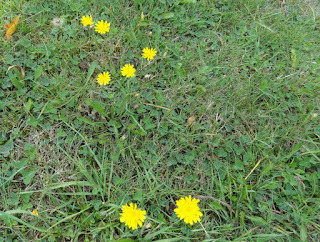 These small flowers were trying to do things in their own way, like Frank Sinatra. 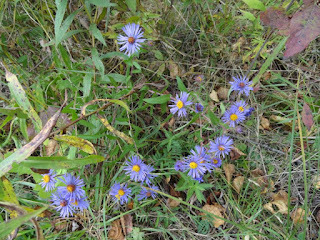 They’re almost more spring like, but here among the fall flowers is where they are. They seem delicate, but are a nice present. 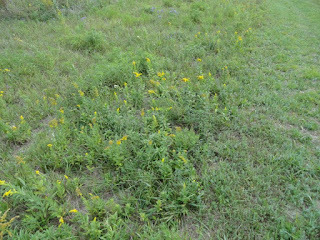 After looking those over, what should I spot, but another group of yellow blooms. These also are a warm spot for a fall day’s viewing. 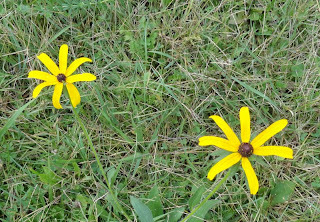 Only a minute later I spied yet some different yellow things. These longer petals reminded me of tiny bananas. Okay, so I have a vivid imagination. 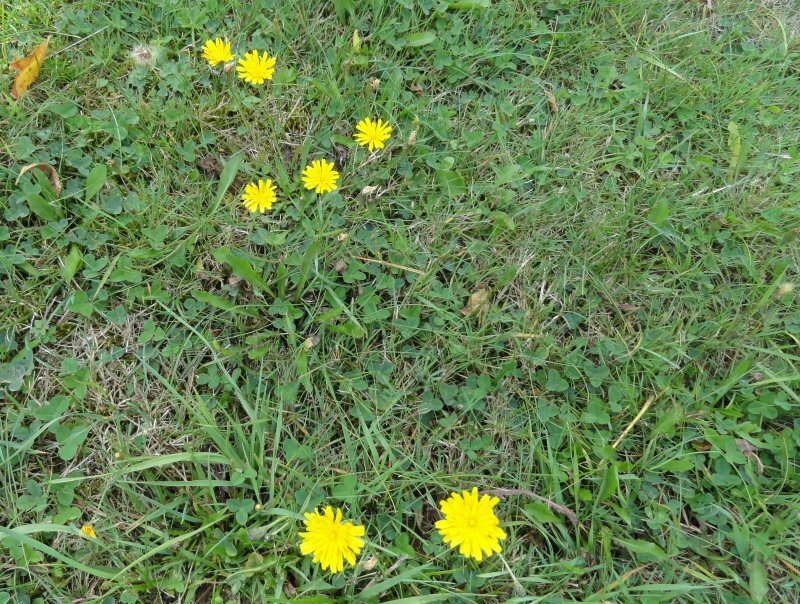 As my day’s journey was wrapping up I spotted these clover blossoms that are refusing to die this early. It seems they may linger on awaiting their final demise in the first snowfall of winter. Winter, that’s a whole different season, and possibly I’ll find something worthy of photography then. 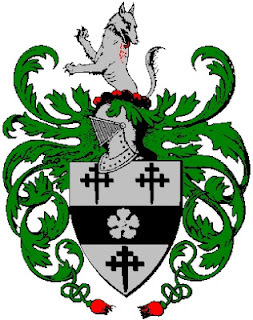 During the twelfth century what is known as a coat of arms was first used. At first they were used as a family symbol only by royalty, but later the practice expanded to the point where nearly every English family had developed their own. Due to their considerable investment in fisheries the first known coat of arms of the Lawton family was a golden shield crossed by a red chevron with three red dolphins on its surface. There was a closed helmet indicating this was a gentleman, rather than a knight. Later a female Lawton wed a male Davenport. As was the custom of the time Davenport assumed the name Lawton, as that was the location of the estate Agnes brought to the marriage. With the marriage of the two names the coat of arms was changed reflecting the Davenport connection. The newer coat of arms had a straight bar, known as a fess replacing the chevron. Above this were two crosslets while below yet was a dolphin, but now blue. Still later as times changed and the fisheries became history the coat of arms was yet changed again. This time it became what it is yet today. It became a silver shield versus its original gold. The fess, or straight bar, was retained across the middle. The bottom dolphin was omitted in favor of a third crosslet. It also now sprouted mantling on its perimeter. Much more could be written about this coat of arms, but not within the space of this article. 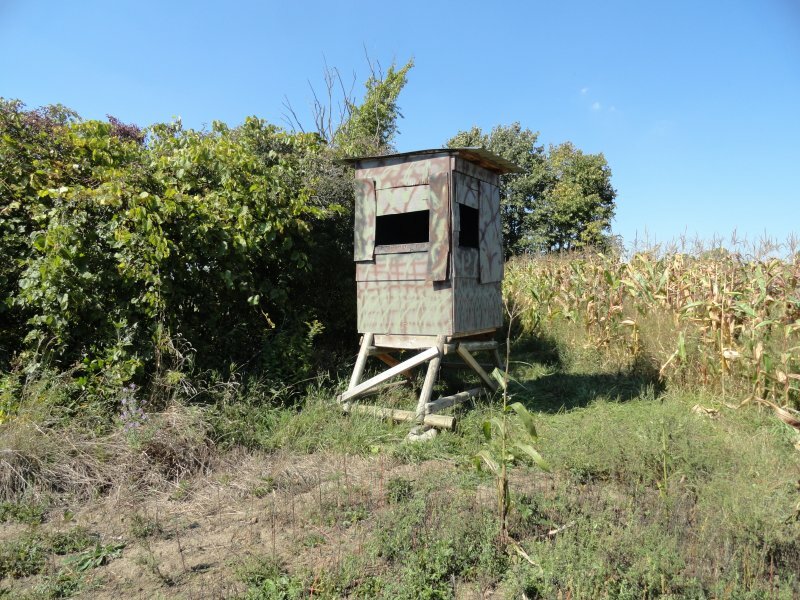 It’s getting closer to that time of year when a lot of sportsmen are beginning to think of deer hunting with more than a passing interest. With that in mind I made a circuit around snapping photos of some deer stands for the benefit of those who may be interested in building one or more for themselves with no idea of where to begin. These are all somewhat near my home although I own none of them. I have used some of them in the past though with the owner’s permission. They are left in place year round, so they do not spook the deer near opening day. 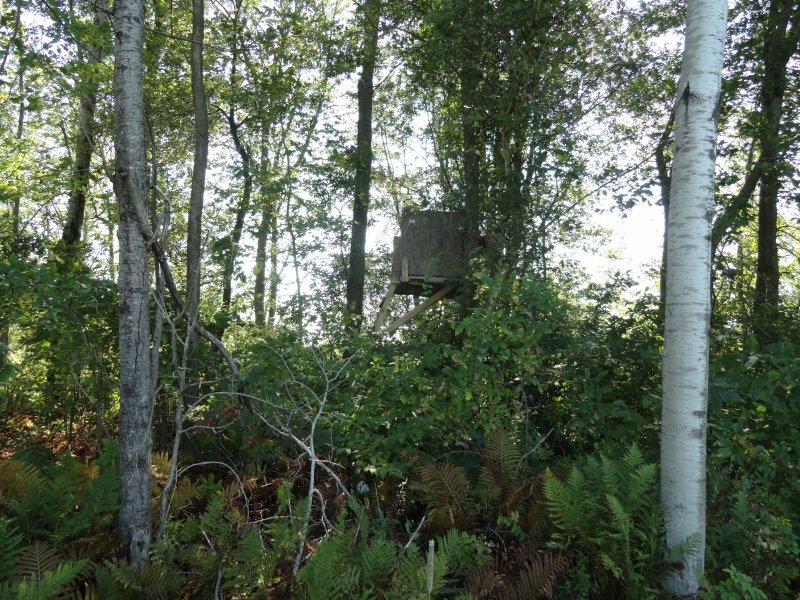 This first one is on my own property, built and placed there by one of my nephews. 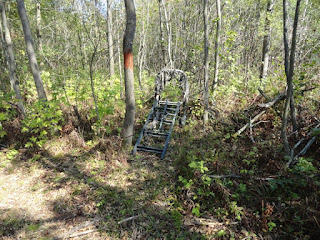 Note that it is on a cleared trail of some 6’ in width. 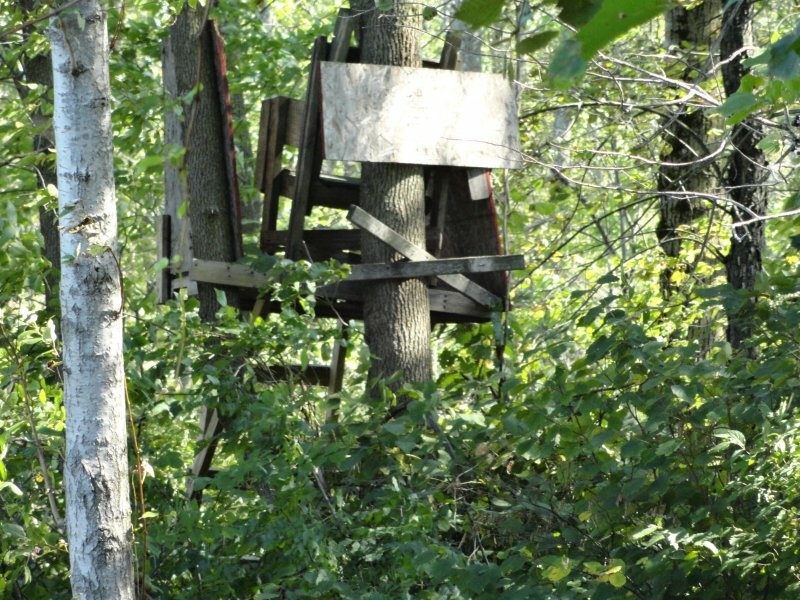 This tends to bring the deer right past it on their way to a corn field which is about 100’ or so directly behind it. I do not recommend bringing the lab along while using the stand, but it’s okay while photographing. 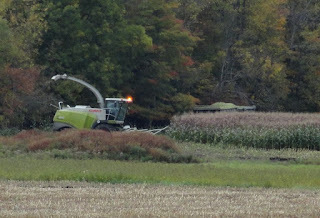 This next one, a cold weather model, is obviously also placed right next to a corn field across the road from my home. 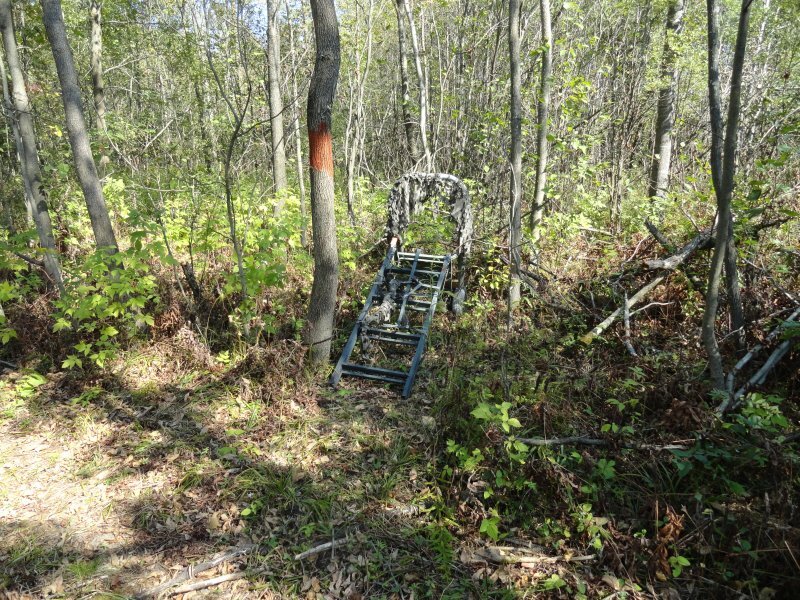 The deer do not generally walk right near it, but do appear within easy gunshot range. 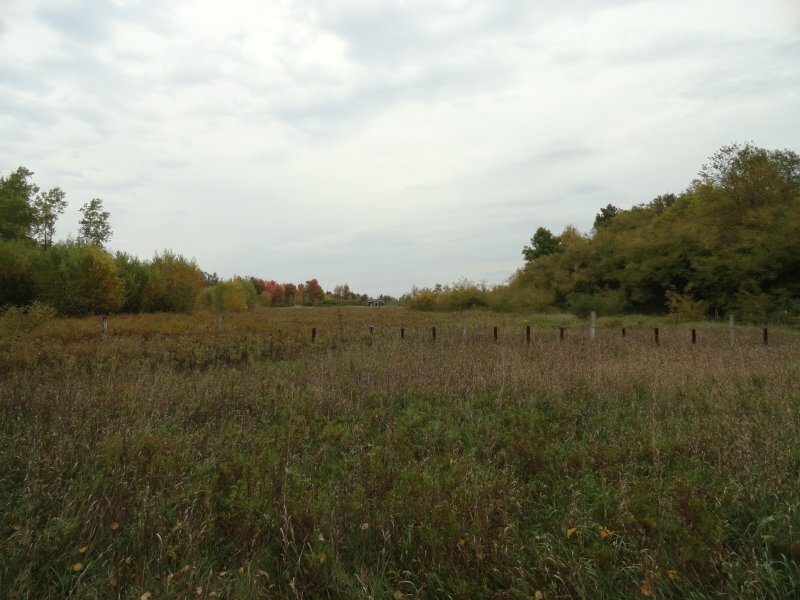 The idea of placing it where it is, is to use the fence line to sort of blend it into the surroundings. This is the back side of a stand placed in the woods at the other end of that same corn field. It also commands a view of a woods trail similar to the one on my property. 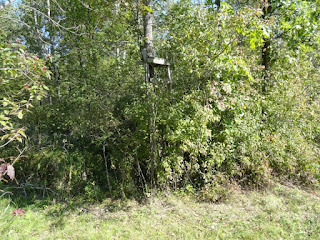 This is a side view of the same stand showing the placement of plywood sides to shield the wind some. The sides are cut low enough to allow shooting in all directions. This one is a stand up stand. Note that it is only about a foot in depth. 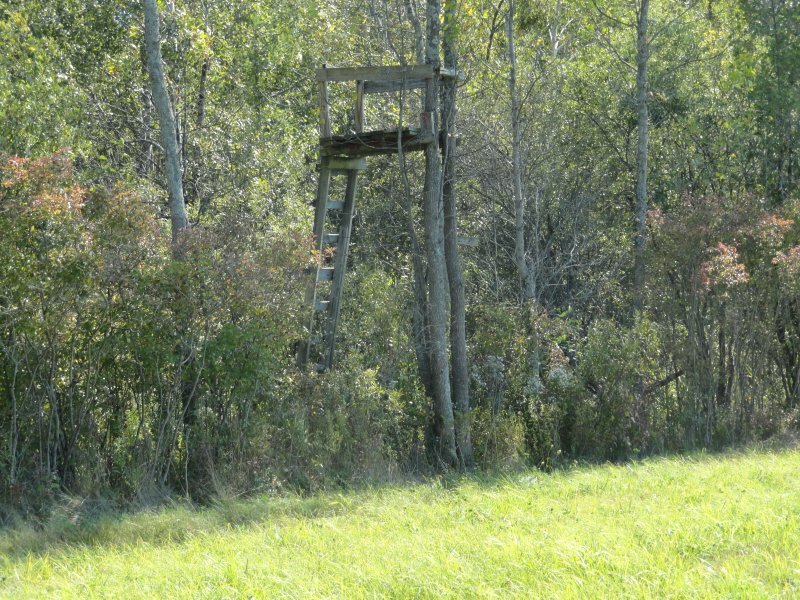 The owner likes to stand while he bow hunts. He stands on the platform with a safety strap tied around the tree. The tree somewhat breaks his silhouette while he patiently awaits his future dinner. 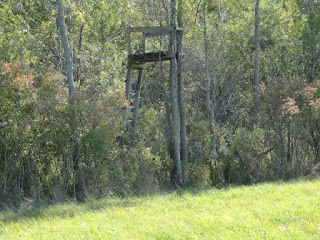 This is a purchased stand that will soon grace the tree it is near. 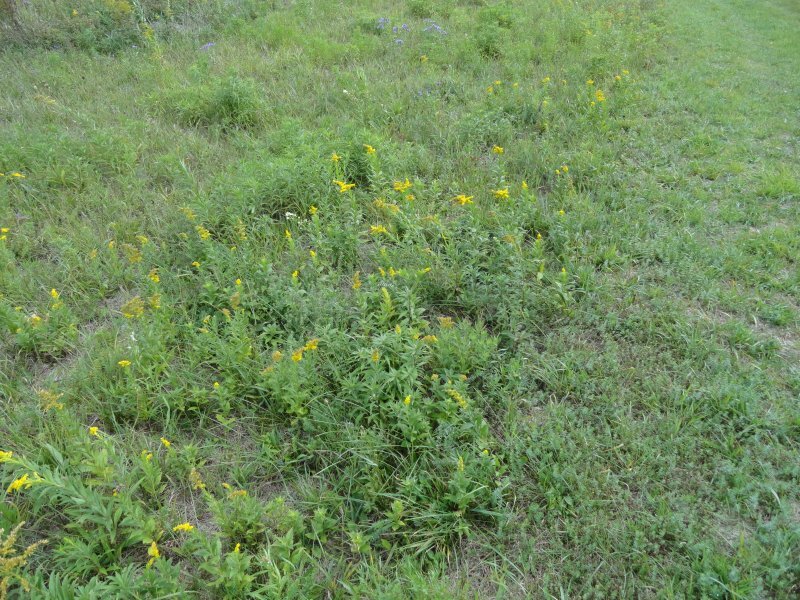 It is alongside of another cleared trail of some six feet in width leading to a corn field. 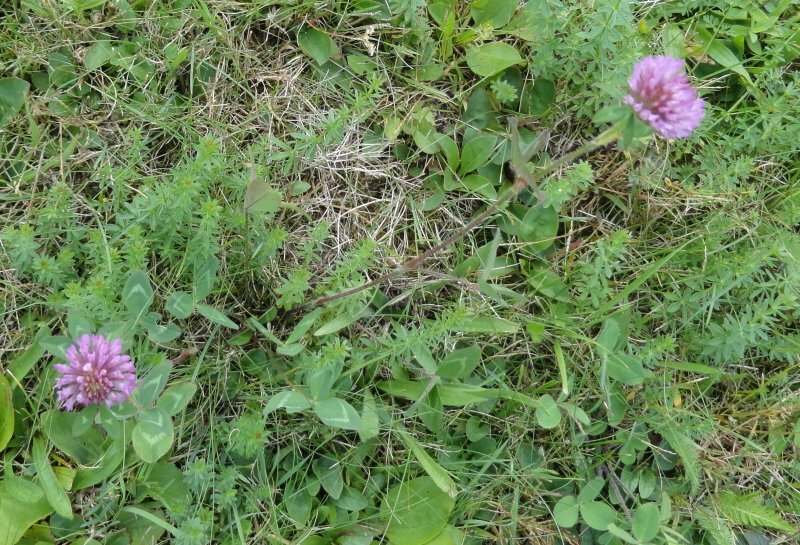 This last one has a view of a hay meadow with clover. 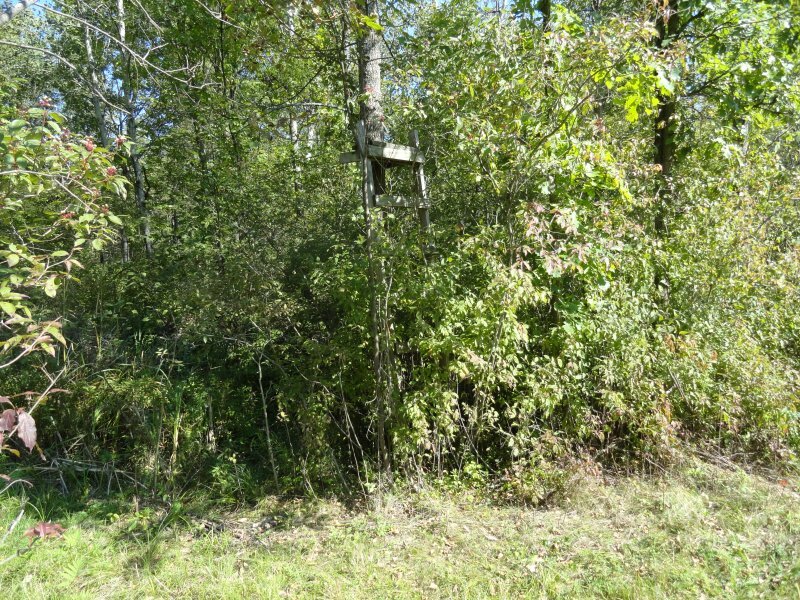 It is not as good as alfalfa, but deer do regularly come within gun range of this stand. I can actually see this one from a window in my home. 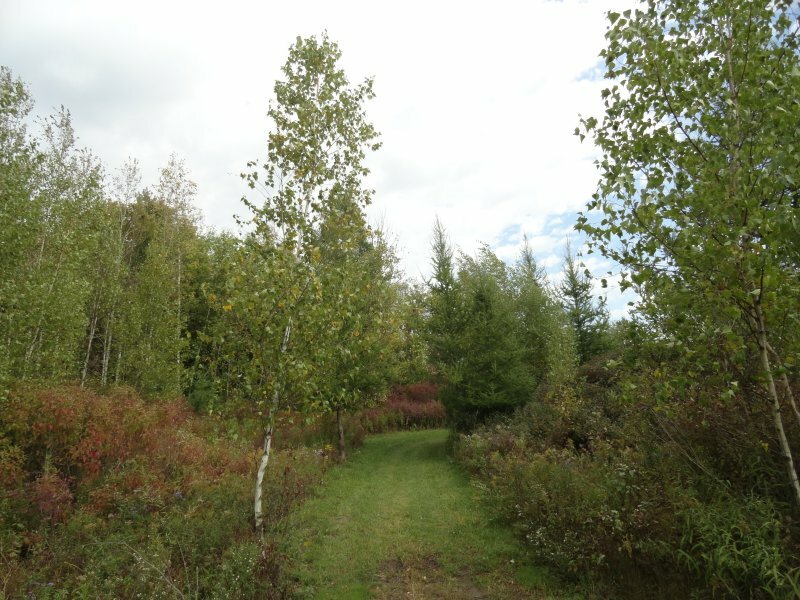 The woods is more of a background than a hunting area. 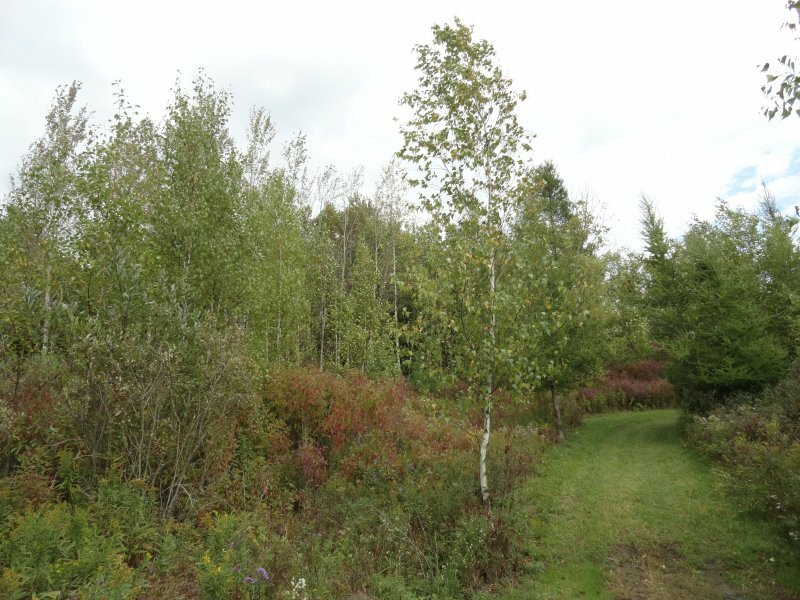 It would be difficult to spot a deer within, even if one was there, which is unlikely. The food is this side of it. We had planned a day trip in search of the elusive trout for several days. Today started with a nice sunny morning, so Ron and I executed our plan. I think we made the right choice. After an uneventful ride of about 55 miles filled with wise dispensations of otherwise unobtainable knowledge we arrived in the wee hamlet of Santa Clara in Franklin County, New York. No a hamlet is not part of a pig, it is a small group of homes near each other. This first photo is of the tranquil St. Regis River as it meanders northwest toward the village of St. Regis Falls. It is taken from the bridge where route 458 crosses the river. 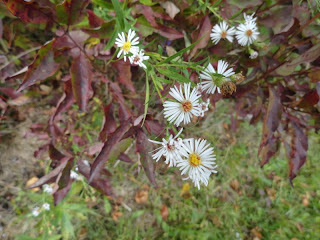 Notice the leaves beginning to change into their fall wardrobes. 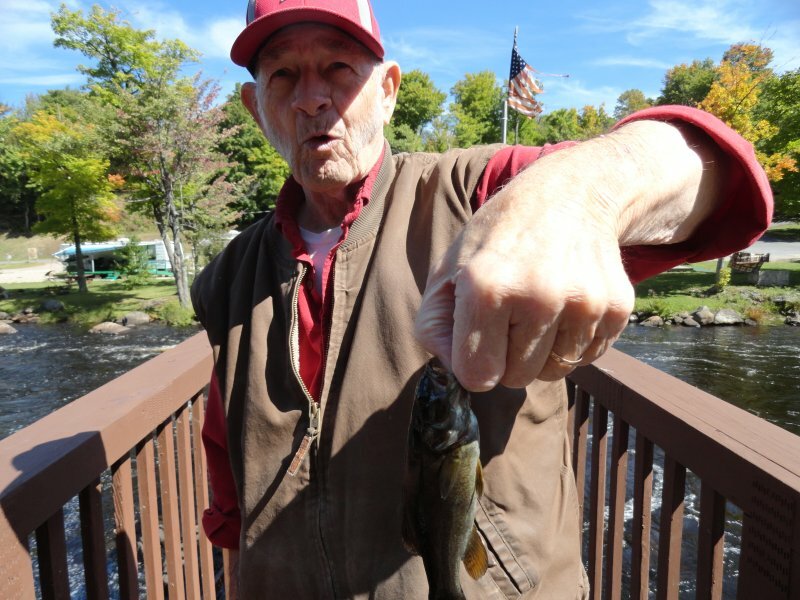 Although our stated quest was for trout of one sort or another Ron’s first visitor to the succulent worm he attached to his hook, in turn tied to his rod and reel with some monofilament, was a bullhead, of all things. It’s a cousin to a catfish, or at least looks as if it is. It was maybe a foot long, but we didn’t want to take time to measure it before tossing it back in the water. It shall live on for a while until possibly it makes the same mistake again. 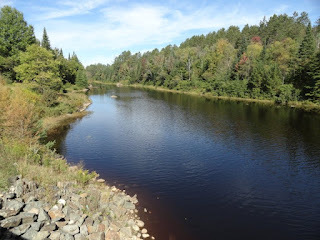 We moved on by driving into the campgrounds located within the Village of St. Regis Falls. 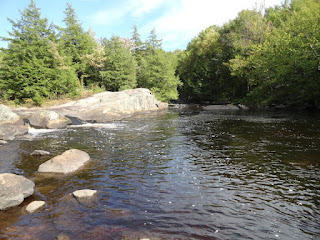 Here there is a lovely campground alongside the St. Regis River some five miles from where we started in Santa Clara. 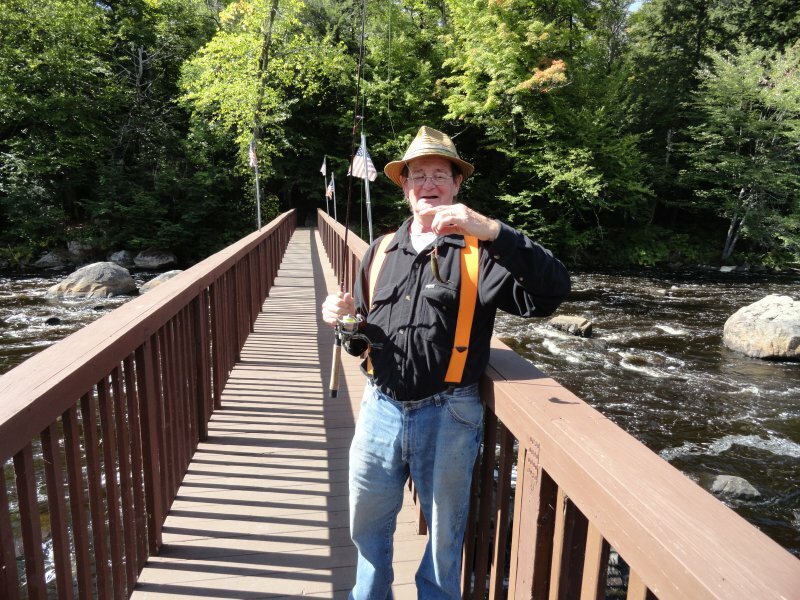 On his first cast off this scenic little wooden bridge to nowhere, used as a fishing pier by most visitors, Ron caught a monster after a vicious fight. I think his practiced eye identified it as an Orca, which I believe I heard once was short for “little shrimpy fish,” but I’m not sure. Maybe I am confused. A few casts later Ron actually caught one of the trout things for which we were searching. 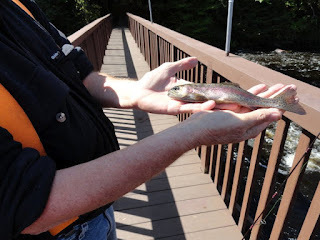 It was about 8” – 9” in length, but again we took no extra time out of the water for measuring this rainbow before tossing it back to grow some more. Aren’t they pretty though? 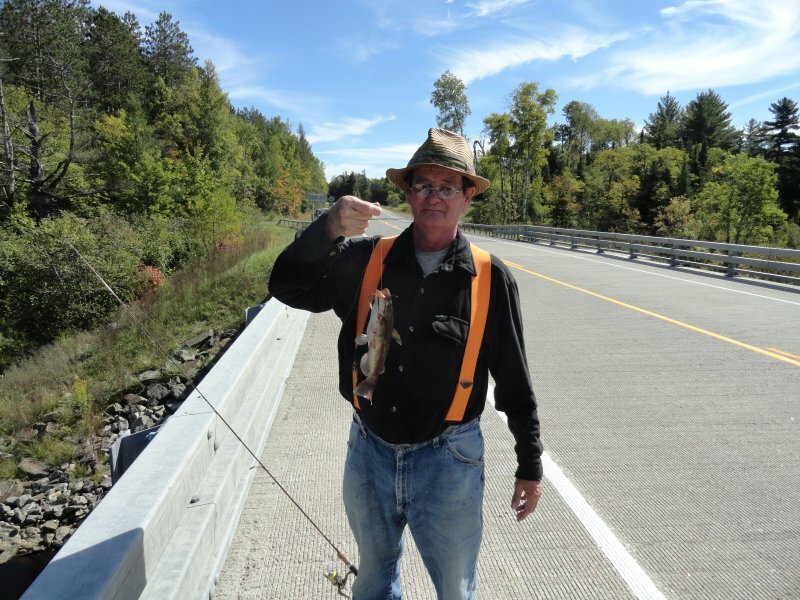 You may have noticed that Ron has caught all of the fish up until now, but was I skunked for the day? Not by a darn sight. This chub jumped out of the water some ten feet to attack me while I stood on the bridge. As I stuck out my hand to ward it off, it bit my thumb and held on. 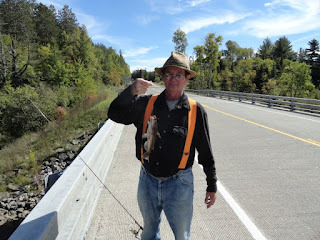 After catching all of the fish presently in the river at that time we moved on. We drove through the village of Dickinson Center on our way for a rendezvous with the Deer River. 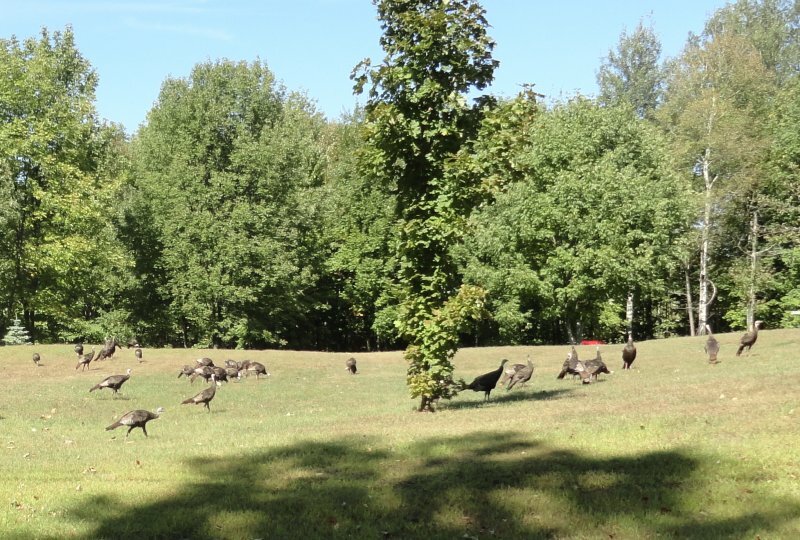 On the lawn of a home within the village Ron spotted a flock of turkeys. This seemed unusual enough to warrant a photo. There are approximately 30 birds in this flock consisting of about four hens and their poults. 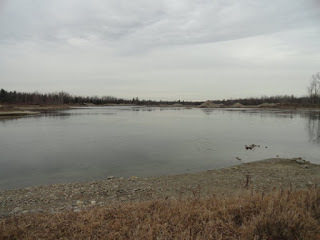 Soon we were on the banks of the Deer River. This view is looking up stream past an island with the largest rock on it. Water is cascading down over a small water fall on the right, and also entering from the left between the rocks. Today it was not to be, but Ron and I have caught several nice trout at this exact spot in the past. 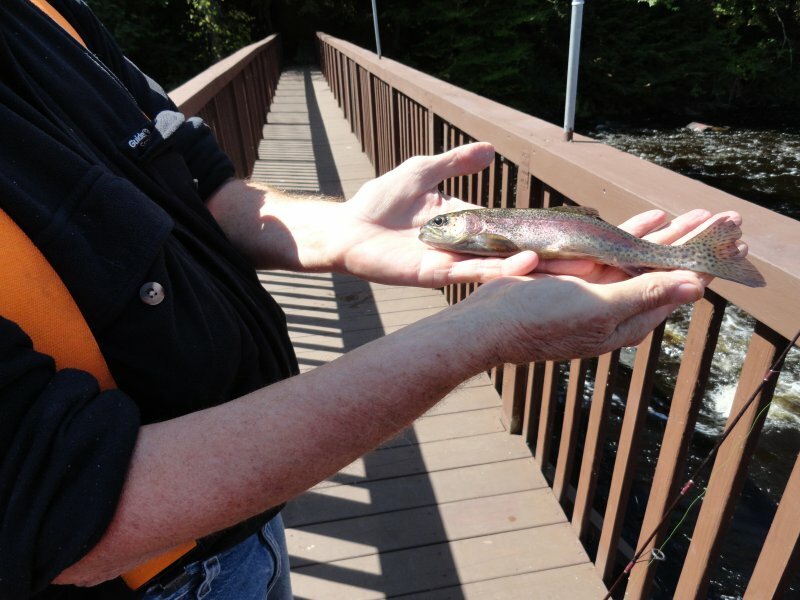 I think the total count today was four rainbows for Ron as well as several chubs and the bullhead. The only thing I caught was the one that caught me. 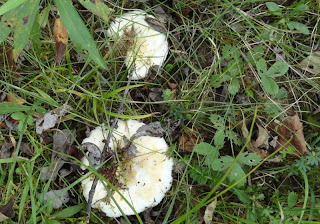 A few miles from the last place we fished on the Deer River I spotted these white furry things on a farm. There appeared to be about 200 of them, more or less. 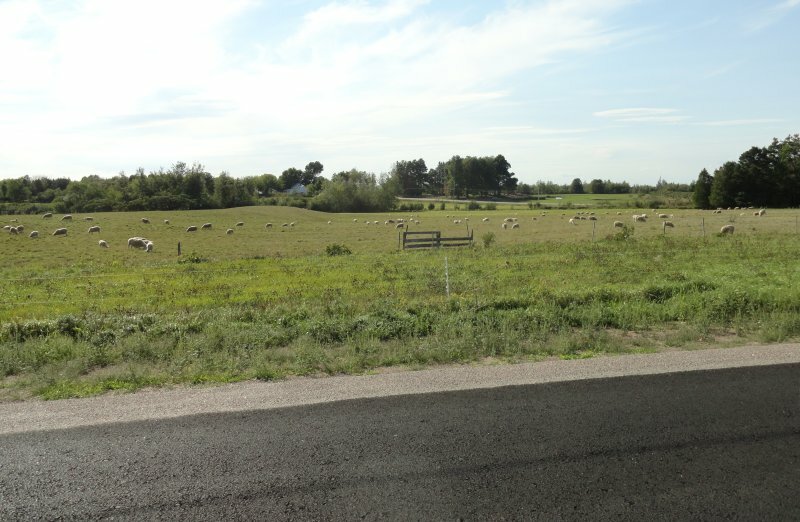 There are not a lot of sheep in these parts so I snapped a quick shot of them. 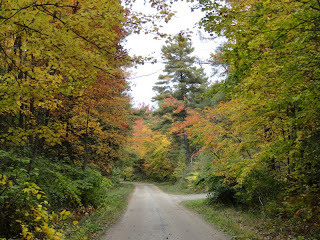 From there it was fifty miles of bumpy road back home with nothing to show for our day except these photos for memories.